With the beginning of autumn comes the introduction of a new color palette that reflects the changing leaf colors, shorter days, and cooler temperatures. Ruby reds and vibrant oranges replace the hot pinks and icy blues of summer, and lately we’ve seen these new colors trends reflected on the catwalks, in the lookbooks, and all over the fashion blogs. Today, we’re paying homage to the new season with products inspired by the colors of some of our favorite autumn things. Nothing screams autumn quite like the sight of jewel-toned leaves. This Jack by BB Dakota Bandz Woolen Jacket from Urban Outfitters captures the vibrancy of the changing leaf colors, as does this exquisite Cerise Shift Dress from Anthropologie. We know, we know. It’s not Thanksgiving yet, but what would autumn be without pumpkin pie? This Double V-Neck Sweater from Express comes in an orange reminiscent of our favorite autumn dessert, and the unexpected detailing on the back gives it an understated elegance. Right now, the sweater is buy one, get one 50% off, so hop to it! We’re also enamored with these orange Pudil Flats by Aldo. Pair them with a black pencil skirt for Halloween flair that’s safe for the office. There are few things more inviting on a chilly autumn night than a warm, crackling bonfire. The color grey usually gets a bad name for being boring or bland, but this grey nail polish (NARS Nail Polish in Galathee from Sephora) proves to be both sophisticated enough for a fancy night out, and casual enough for a quick coffee with friends. If you’re looking for something a little more flashy, Rain Drops Nail Varnish by Illamasqua (also available at Sephora) comes in a shimmery light grey. The last few years have been all about knee-high boots in riding and western styles, but we’re loving the lower-cut ankle boots that have been making the rounds in fashion blogs. These boots are both cute and versatile — wear them with summer dresses and bare legs now, and slip them over leggings or skinny jeans come fall. Some of our favorite styles are the Fiera double zipper booties by Aldo and the combat-inspired Towner booties by Nine West. We also like the eclectic boot styles Cupcakes and Cashmere blogger Emily Schuman highlighted in this recent post. A classic trench coat is a must-have piece — throw one over any outfit for instant polish. Asos has a great selection of trenches at affordable prices. We like the Asos Classic Trench and Asos Skater Trench, both of which come in camel or black. If you’ve been affected by the recent heat waves in the midwest, cozy knit sweaters are probably not at the top of your “to-buy” list right now. That being said, this Forever 21 Floral Open-Knit Top is a lighter option for early mornings or crisp evenings. For those of you living in cooler regions, we love the adorable detailing on Topshop’s Knitted Tie Back Cable Top. Which fall trends are you looking forward to wearing the most? Tell us in the comments! Beyond beautiful weather and longer days, one of our favorite things about summer is berry season. As summer approaches, we dream of luscious strawberries, plump blueberries and fun hybrid berries like olallieberries. And, like most people, we love berries in all forms — fresh, in pies, and as jams — but our favorite thing to do with berries is to enjoy them in summer cocktails. In the spirit of summer cheer, we’ve included recipes for two of our favorite cocktails so that you, too, can take advantage of berry season before it’s over! Start by muddling the strawberries and basil leaves and vodka in a glass*. Transfer the mixture to a cocktail shaker and add the pureed strawberries to the mix. Add ice, shake for 15 seconds, and then pour everything back into the glass. Lastly, fill the glass with lemonade and stir before serving. *we like these Rocco Blue Double Old-Fashioned Glasses or, if you’re feeling playful, these Mustache Double Old Fashioned Glasses. Both are available at World Market. Start by muddling the mint leaves in a cocktail shaker, like this one from World Market. Add the berries and continue muddling. Add the remaining ingredients into the cocktail shaker and shake to combine. Strain the mixture into a rock glass* and enjoy. *we’re fans of the Harry Rocks Glass from Crate&Barrel — beautiful and inexpensive. We hope you enjoy these recipes, and we’d love to hear about your favorite summer cocktails in the comments below! A good athletic hat serves multiple purposes: keeping the sun off of your face and keeping hair and sweat out of your eyes. Look for a breathable hat with reflective panels like the Performance Train Cap by Reebok to keep you cool and visible during your workout. However, don’t assume that wearing a hat will absolve you from wearing sunscreen! You should still apply waterproof sunscreen on your face and other exposed parts of your body every two hours to avoid sun damage when exercising outside. We love this tank top’s unique perforated cutouts and sweat-wicking fabric. This well-ventilated tank top also provides a supportive shelf bra and UPF protection from the sun’s rays, making it perfect for outdoor activities like a game of kickball or leisurely jog. The Run Speed Short is one of Lululemon’s most popular items, and for good reason. Its 2 ½” inseam is short enough to keep you cool, without showing too much leg. Lightweight fabric, paired with a COOLMAX liner, wicks moisture away, while a convenient zipper pocket on the back of the waistband allows you to go hands-free during outdoor activity. Fans of WrightSock’s CoolMesh sock series swear by its ability to wick moisture away even on the hottest of days. Don’t let the CoolMesh II’s double-layer design fool you — these socks are surprisingly light, and the layers absorb friction and moisture to prevent blisters. The high tab-back also prevents uncomfortable chafing along your heel and achilles. June might very well be the perfect month to host a long, leisurely outdoor dinner party for friends and family. I recently stumbled upon this gorgeous photo of a backyard on Style Me Pretty, and dreams of dinner parties have been dancing in my head ever since. Luckily, Shopilly brands like Restoration Hardware, West Elm and Anthropologie make it easy to recreate this rustic glam backyard look. Even more luckily, a couple of the pieces that I picked out are currently on sale, so check them out today! My favorite decorations in the backyard photo are the romantic string lights strung around every tree. String lights give any space a warm, festive feeling, and you can maximize the effect by choosing yellow lights over harsher white lights. 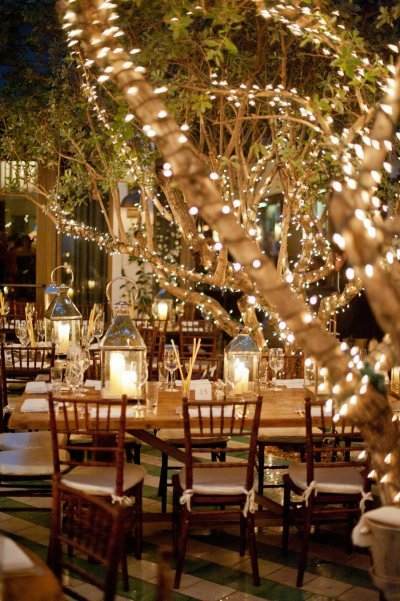 Restoration Hardware’s delicate Starry String Lights are available in lengths ranging from five feet to 100 feet. The wood base and metal cover provide a nice contrast on these candle lanterns. They’re sturdy enough for outdoor use, but can easily transition to indoor settings in the colder months. I prefer the look of these mason jars to the wine glasses used in the backyard. Especially for a small, intimate dinner party, these provide just the perfect touch of hominess and informality without detracting from the sophistication of the remaining décor. Lest we forget the “rustic” in rustic glam, these woven placemats perfectly complement the softly glowing lights and mason jar sippers I’ve chosen above. Using placemats for a dinner party speeds up the cleanup process, and at just $14 for a set of 2, these are a steal! Lately, we’ve noticed a variety of cute wedge sandals cruising the sidewalks and gracing the fashion blogs. We’re fans of this trend – wedges provide a comfortable way of adding height to your stance and sophistication to your outfits. Plus, for anyone not blessed with the natural talent of being able to balance or walk in heels, wedges are a safer alternative. Below, we’ve picked out five wedge sandals that are the perfect fit for any budget and the perfect finishing touch for any spring outfit. With a 4.25” heel, these wedges may be sky-high, but the thick foot straps and ankle strap make these much sturdier than your average pair of strappy sandals. The wedges come in black, blue, cognac and red, and at just $29.99, the price is definitely right. Pair these wedges with a pair of cropped jeans or your favorite maxi dress. If you’re looking for a pair of wedges that can easily transition from office hours to happy hour, this is the pair for you. Featuring a Perspex (shatter-resistant acrylic glass) wedge heel, Asos’ Piccolo Wedges put a modern twist on the wedge heel. While they don’t fit perfectly into the sandal category, the peep toe openings give them a springtime feel. These wedge sandals come in three colors, but the jewel-toned teal is decidedly our favorite. We’d wear these with a pair of dark tuxedo shorts for a pop of color and a leg-lengthening effect. If you think wedge sandals are too dainty and sweet, think again. Featuring a mini wedge, these black leather gladiator sandals are easy to walk in and can toughen up any outfit. Try pairing a feminine swing dress with these gladiator sandals for an unexpected contrast. Leather and wood combine to create these gorgeous wedges by the Spanish clothing company Mango. The neutral coloring makes these sandals extremely versatile – you can just as easily wear them with jeans as with flowy trousers or a fitted dress. Summer is still two months away, but with the days growing longer and the weather warming up, it feels like it’s right around the corner (at least in this part of the country – apologies to our friends in the Midwest who are being slammed by more snow!). If you’ve been daydreaming about your first visit to the beach, or if you’re planning for an ocean-side vacation, this post on beach essentials is for you. Want a cute bathing suit? Check out J. Crew’s 2013 line of swimwear, which features fun patterns like summer stripes and playful polka dots. With a variety of cuts and styles – for example, bottoms are available in hipster, high-waisted brief, bikini and lowrider cuts – you can mix and match tops and bottoms to create your ideal bathing suit. Too much of a good thing can be bad, and that definitely holds true for sunshine. Protect your face from the harmful effects of the sun’s UV rays with a stylish, oversized hat. This floppy hat from Target gets the job done without leaving a dent in your wallet. I’ve never been a fan of the thong style of flip-flops, so I’m much more likely to reach for a pair of slingback sandals like these. Plus, the two-tone textured leather makes these sandals extremely versatile – they can go straight from the beach to boardwalk to bar. A big, sturdy beach bag is a necessity for safe-keeping your beach towel, sunscreen, reading materials and snacks. Choose a canvas bag, like this printed tote from Gap, for easy cleanup, as it wipes clean after a long day at the beach. This cotton and cashmere poncho is light, airy and soft – everything I want in a beach cover-up. Even better, it’s currently on sale for $49.50 off $10 from its original price. Did I leave out any of your favorite beach essentials? Share them in the comments! If you like us on Facebook, you probably saw our announcement earlier this week that we’ve redesigned our homepage to make it easier for you to log in to Shopilly or create an account. Well, that’s not all. Thanks to feedback and insight from users like you, we’ve optimized Shopilly to provide a savvy, clutter-free shopping experience. Today we’re highlighting some of our favorite features, which allow you to explore, discover, organize – and live Shopilly ever after! We’ve placed this handy checklist in the Home tab to help you make the most of your Shopilly account. Have you followed your favorite brands to stay updated on their sales and new products or collections? Have you linked your email to de-clutter your inbox of marketing emails and shopping receipts? And – we couldn’t leave this one out – have you invited your friends to join Shopilly? Upon logging into Shopilly, you’ll see thumbnails in your Home tab that keep your account organized and make it easy to window shop by category, for example Hot deals, Flash sales and Fashion. Shopilly also tells you how many new emails you have in your inbox and how many new posts you have to catch up on from your favorite brands. If you’re curious about what the Shopilly brands have been up to lately, scroll down to the Recent Activity section of your Home tab. This news-like ticker is refreshed every time a brand posts an update. If you’ve already followed all of your favorite brands but are looking for a new brand or two to explore, navigate to the Brands tab and click ‘Popular’ to see which brands other Shopilly users favor. You might just discover an exciting new sale or your next favorite store!